How are edgematched features adjusted? The Generate Edgematch Links and Edgematch Features tools are designed to be used together to perform edgematching. This document explains and illustrates the edgematching process and its results. When linear features in adjacent areas, such as roads and rivers in two neighboring counties, are collected by different organizations, at different times, or using different standards and methods, they may not be connected where they meet at the county borders. Not only can the data not be mapped accurately, but more importantly, they can cause problems in analysis. 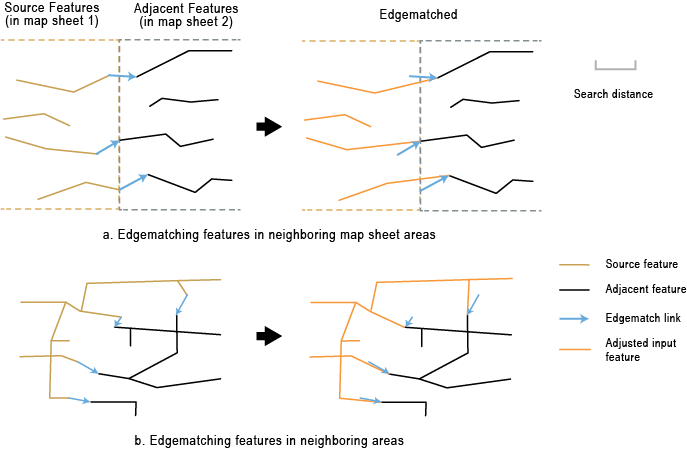 Edgematching is the process of finding corresponding disjoined features along the bordering edges of two adjacent line datasets and properly connecting them. The bordering edges are typically along the common boundary between two map sheet areas or any administrative or other types of boundaries. Figure 1 below represents two different scenarios of bordering edges and the edgematching results. 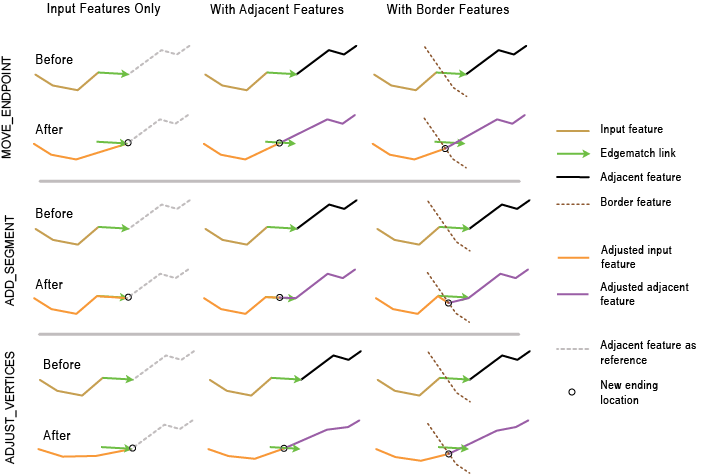 Traditionally, edgematching was done in an edit session by interactively drawing individual edgematch links (also known as displacement links) from source features to adjacent features and then applying an edgematch method to adjust features based on the links. This manual process is time consuming and costly. Using advanced edgematching techniques, the geoprocessing tools Generate Edgematch Links and Edgematch Features are used to solve edgematching problems automatically. The Generate Edgematch Links tool automatically finds where source and adjacent features are disconnected within a specified distance and generates edgematch links. The Edgematch Features tool uses these edgematch links to connect the features. Figure 1 shows this process. For clarity, the effect of adjusting only the endpoints of source features to connect with the adjacent features is shown in the figure. The key to the automated solution is to match source features and their corresponding adjacent features. The matching accuracy largely depends on data complexity and quality. Normally, a high percentage of successful matching can be achieved, while uncertainty and errors may occur and require postinspection and corrections. Using the automated tools with some postprocessing, the edgematching tasks can be accomplished with significant time and cost savings. The source and adjacent features are considered matches if they fit a set of characterization criteria, including the number of candidates involved, attribute match status, and continuities from source features to adjacent features and vice versa. To facilitate postprocessing, for every edgematch link, a value representing the edgematching level of confidence is written in the output field EM_CONF. The EM_CONF values are derived from the above criteria, and the values are greater than 0 and less than or equal to 100 (where 100 indicates the highest confidence). The following examples illustrate edgematch links and the EM_CONF values. Example a in Figure 2 shows one source feature matched with one adjacent feature with good continuity and no ambiguity. The edgematch link gets EM_CONF value 100. Example b in Figure 2 shows multiple source or adjacent features within the specified distance. The increased ambiguity results in the reduced EM_CONF value 50. Example c in Figure 2 shows multiple source and adjacent features within the specified distance with relatively weak continuities. Therefore, the EM_CONF values of the various links are much lower. Given the edgematch links, you can use the Edgematch Features tool to adjust features for desired edge connections. Based on the inputs you provide and the method you choose, the features associated with the links are adjusted to end at new connecting locations accordingly. See the Edgematch Features tool reference for detailed descriptions. The examples in Figure 3 below illustrate the various edgematching scenarios.